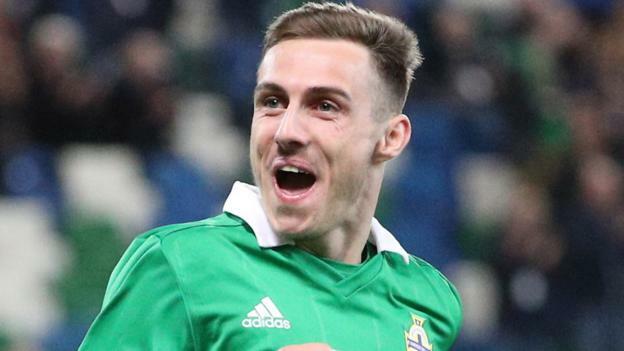 Substitute Gavin Whyte scored with his first touch in international football as Northern Ireland beat Israel 3-0 in Tuesday’s friendly in Belfast. Whyte, 22, who joined Oxford United in the summer from Irish League club Crusaders, scored 106 seconds after coming on to make his debut. Earlier skipper Steven Davis and Stuart Dallas had given Michael O’Neill’s side a 2-0 interval advantage. Last Saturday NI lost 2-1 to Bosnia-Herzegovina in the new Nations League. Northern Ireland manager Michael O’Neill had called on his squad to be more clinical in front of goal after squandering a series of openings in that defeat, and they responded in style against an admittedly limited Israeli team ranked 66 places below them in the Fifa standings. The hosts had found the net only three times in their previous seven outings, failing to score in five of those, but their new expansive style of play paid dividends in securing a confidence-boosting win. Northern Ireland have now won four and drawn five of their 10 meetings with Israel and triumphed in six of their last seven home friendlies. Southampton midfielder Davis and Leeds United winger Dallas have both struggled to secure regular first-team football for their clubs this season, the former’s only appearance so far coming in a League Cup game. Both players shone throughout this game however, Davis firing home a sweetly struck first-time right-foot shot from a Paddy McNair corner which went whistling past goalkeeper Guy Haimou in the 13th minute with the aid of a deflection. George Saville then provided the pinpoint left-foot cross for the unmarked Dallas to score his third international goal at the back post with a side-footed volley. In the second half Davis, now with 11 international goals, provided a neat flick to send Saville through on goal, but the Middlesbrough player skewed a left-foot shot wide. Whyte’s sensational introduction to international football saw the debutant fire home in the 67th minute after the Israeli goalkeeper had denied fellow substitute Conor Washington, who missed two other chances. Whyte is seeking to emulate fellow former Crusaders player Dallas in making a major impact in international football, having scored 21 goals in helping the Belfast side win the Irish Premiership title last season. His outstanding form saw him named Player of the Year and Young Player of the Year by the Northern Ireland Football Writers and the winger has started his career for Oxford United in style with three goals in six appearances. Whyte was part of the squad which travelled to play Panama and Costa Rica in Central America in the summer but did not play. He was originally named in the NI Under-21 squad to face Luxembourg in a friendly on Thursday and Spain in a European qualifier on Tuesday, but was called up to the senior squad by O’Neill thanks to his impressive early-season form. Whyte’s fellow Under-21 player Paul Smyth also scored as a substitute on his senior debut against South Korea in March.